For the second year in a row, to celebrate the big game this Sunday — yep, Puppy Bowl XII — Uber is teaming up with Animal Planet to deliver adoptable puppies Wednesday in seven U.S. cities. For $30, Uber drivers and rescue representatives will deliver puppies for 15 minutes of play time during the #UberPuppyBowl event. And that’s not all — the entire $30 is donated to the rescue that supplied the puppies. Just make sure your boss or building is okay with hosting a quarter-hour of puppy goodness. And be sure to have an enclosed space or a room available in which to play with the puppies. In the very likely event that you fall in love with one of the puppies, the rescue representative will be happy to get you started on the adoption process. 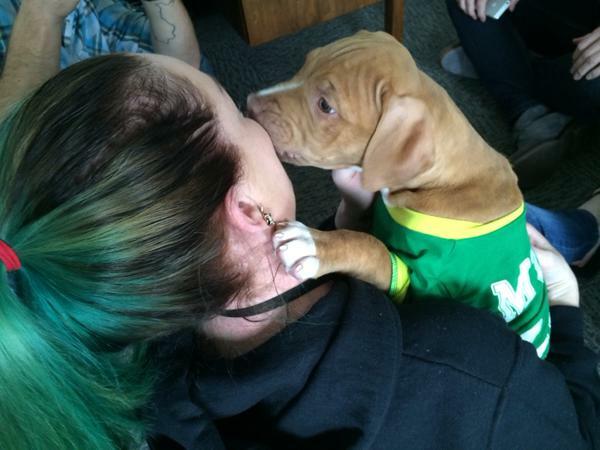 During the debut of #UberPuppyBowl last year, more than 70 of puppies found forever homes (including Pepper Jack, the itty bitty Pittie in the photo above). Playdates are available Feb. 3 between 11 a.m. and 2 p.m. The participating cities this year are Chicago; Denver; Los Angeles/Orange County; New York; Phoenix; San Francisco/San Jose; and Washington, D.C.
To request a puppy delivery — and do realize the demand will be high, so be very patient — open the Uber app and select the “Puppies” option. For more information, visit the Uber website.